What possibly could be ‘happy’ about death? The love of your life is about to leave this world and you’ll be totally alone. I was soon to find out it was not about me. In December 2014, my dear Fred came down with strep throat, which turned into impetigo, which like strep throat is a bacterial infection of the skin. By May, his rash had ulcerated; it was stage four melanoma. My husband went into home hospice. In the three weeks leading up to his death, Br. Michael and Br. Joseph came to the house and chanted parts of the Divine Office, the seven penitential psalms and the Gradual Psalms, which brought us great comfort. The death watch itself lasted 16 hours. 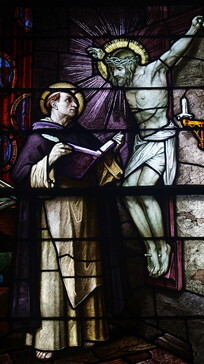 A local priest gave Fred the Last Rites and Viaticum in the Tridentine Rite, Fred also finally received Confirmation. A total of four priests would come and pay their respects. The brothers returned at that time and chanted the full day’s Office (the octave of Pentecost) in Fred’s room and said many other prayers for the dying. In between prayers, my husband was very peacefully between two worlds, and several times became lucid and drank water. He understood everything that was happening and recognized everyone present. The priest who brought him the Last Rites said, “This is a very holy death.” There were a lot of tears from myself and Fred, but it was peaceful at the same time. It didn’t stop there. Fred died at home and his wake was in our home too. Thanks to the brothers the Office of the Dead from the Divine Office was chanted the night before and morning of the funeral. The Mass was a Solemn High Tridentine Requiem with full choir. They repeated this on the two anniversaries of his burial. Folks tell me 70% of people pray for a death like this: at home, surrounded by friends without machines and doctors. It should be a holy time. I will be forever grateful to Br. Michael and the other brothers that helped me to discover that a truly holy death is indeed a ‘happy’ death. Saint Thomas Aquinas House is an independent 501(c)3 public charity dedicated to supporting men pursuing traditional priestly and religious vocations. We welcome your stories about how the vocations we support have impacted your lives. Contact us to make a featured posting and testimonial.